Harbour View/Netherlands - His Excellency Governor Eugene B. Holiday made a working visit to the Netherlands from August 20 to 24, 2012. The aim of the visit was to discuss developments in areas of cooperation and issues of mutual interest against the backdrop of current socio-economic and financial developments. On August 20, Governor Holiday started his official program with a visit to Mr. Klaas Knot, President of the Central Bank of the Netherlands (“De Nederlandse Bank”). During that meeting, Governor Holiday and Mr. Knot exchanged views on central banking developments in the respective monetary unions against the backdrop of current financial, economic and monetary environment. On August 21, the Governor met with Marja van Bijsterveldt-Vliegenthart, caretaker Minister of Education, Culture and Science, with whom he discussed cooperation between the Netherlands and Sint Maarten in the field of Education and Cultural Heritage. More in particular, they shared information on current educational issues and on developments in national heritage preservation. In addition, the Governor received an outline of the approach to national heritage inspection in the Netherlands from Ms. Siregar, Director of the Heritage Inspectorate, in a separate meeting on August 23. Governor Holiday also met with Mr. Matheus Voges, Minister plenipotentiary on August 21. Later that day, the Governor paid a courtesy visit to Mr. Fred de Graaf, Chairman of the Dutch Senate (“Eerste Kamer”). The following day, on August 22, Governor Holiday visited Vice-Admiral Borsboom of the Royal Dutch Navy, with whom the Governor discussed local and regional developments including the upcoming Hurricane Exercise 2012. On August 23, the Governor met with Mr. Maarten Brouwer, Director of the Royal Dutch Mint (“Koninklijke Nederlandse Munt”). This institution is the official producer of Euro coins for the Netherlands and produces Netherlands Antillean Guilder coins for Sint Maarten. During that meeting, Governor Holiday was given an introduction about the activities of the Royal Dutch Mint and received a tour of the premises and was updated on the production process of coins. The Governor also organized a lunch for Sint Maarten students who recently arrived in the Netherlands. They informed the Governor about their experiences of the first weeks in the Netherlands as students. The Governor concluded his working visit, with a meeting with Mrs. 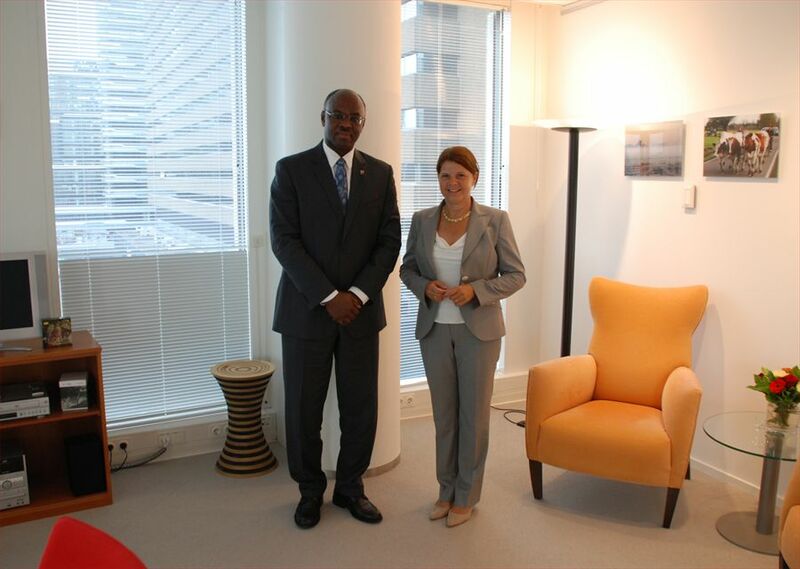 Spies, caretaker Minister of the Interior and Kingdom Relations, with whom the Governor discussed the current political situation in Sint Maarten and in the Netherlands and issues related to the Kingdom.